Looking for a golf cart rental near the Holy City for weddings, corporate events, family vacations, or just about any Lowcountry golf cart rental need you can imagine? Garrett's Golf Cars has you covered! Our Mt. Pleasant location is just a short hop away from the beach, and we're happy to provide golf car rentals for families vacationing on the coast, couples throwing beautiful beach weddings, executives hosting corporate events, and more. Just scroll down to the form below and let us know how many you're looking for and when you need them. We'll have them ready for you right on time! We provide pickup and delivery throughout Charleston county, as well as on the Isle of Palms and Sullivan's Island. USLV LSV rental in Kiawah and Wild Dunes only: $650 per week. Prices do not include applicable sales taxes, which must be added to the total along with delivery charges. Current delivery charges are based on zip code. Please contact us for more information. 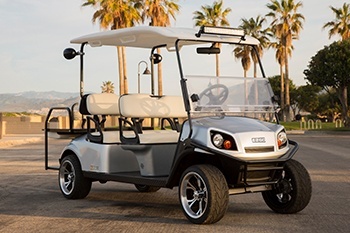 When you're looking for golf cart rentals in the Lowcountry, think of Go With Garrett's Specialty Vehicles. Ready to get started with your Charleston golf cart rental? Just fill out the form below!